HGV Drivers face a huge number of specific rules regulating their use. Often, life is hardest for the individual owner-driver, facing difficult deadlines. We offer specialist legal advice for HGV drivers facing prosecution in Scotland. If you have been identified in breach of the rules limiting Drivers’ Hours, or find yourself accused of any Tachograph Offence, do be in touch. Certain offences are treated very seriously by the Traffic Commissioner and in some cases your professional licence may be at risk. If you would like advice on this, please contact us for a FREE consultation. 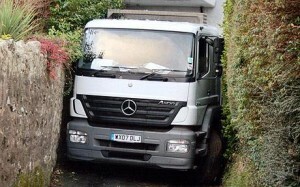 HGV drivers are subject to all the usual rules of the road. Most commonly, HGV drivers face prosecution for driving whilst on a mobile phone, speeding, careless driving and tachograph offences. Once the police have identified one issue, it is likely that they will inspect your vehicle and compile a number of charges against you. This is how the majority of tachograph offences are identified. HGV drivers are often targeted for speeding on the A75. Routinely, after a police inspection, other matters will be brought to light and added to the charge sheet. If you would like to know how best to defend your HGV licence when faced with a speeding charge, or multiple charges, be in touch. Right from the start, you really listened to what I had to say. I’m not a dangerous driver and was angry to be accused of that. I am not used to courts and I felt I had no place in the criminal justice system. You saved my licence and you have restored my faith. I’m pleased to have used you. Thank you.